When Franklin Delano Roosevelt, A.B. 1904, LL.D. 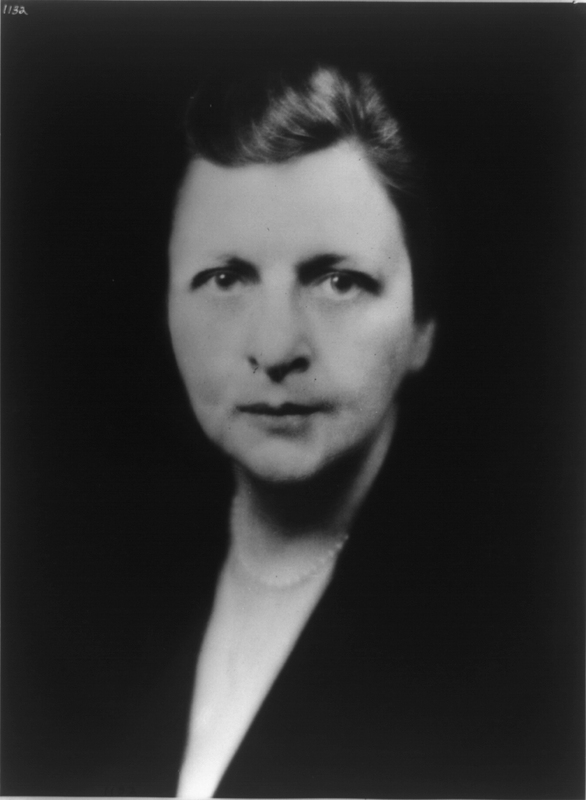 ’29, asked Frances Perkins to be his secretary of labor in 1932, she drove a hard bargain: she would accept only if he would support her social-justice agenda. Perkins wanted federal relief and large-scale public-works programs to help victims of the Depression, along with federal minimum-wage and maximum-hours laws, a ban on child labor, and unemployment and old-age insurance. These were ambitious goals for the time, but Roosevelt agreed. “I suppose you are going to nag me about this forever,” he said. Perkins interpreted that response as an invitation. “He wanted his conscience kept for him by somebody,” she later said—and she was unusually well-qualified for the job. Perkins was born in Worcester, Massachusetts, and attended Mount Holyoke, majoring in chemistry and physics. (After years of touring factories and poring over technical reports, she reflected once that science courses “temper the human spirit, harden and refine it, make it a tool with which one may tackle any kind of material.”) But it was a course in political economy that changed her life: sent into local mills to report on the lives of their workers, she realized that people could fall into poverty due to harsh circumstances, and not simply, as her conservative parents generally believed, because they were lazy or drank. After graduation, she defied her father and became a social reformer. She moved to Chicago, to help Jane Addams minister to immigrants in Hull House, and then to Philadelphia, where her social-work duties included hanging out at the docks, rescuing newly arriving immigrant women before they could be lured into prostitution. She next studied sociology and economics at Columbia and began working for the Consumers’ League, an influential reform group. On March 25, 1911, as she was having tea at a friend’s Greenwich Village townhouse, the butler mentioned a fire nearby. Perkins followed the sirens to the Triangle Shirtwaist factory inferno that killed 146 people, mostly immigrant women garment workers. That disaster “was a torch that lighted up the whole industrial scene,” she said later. As the Consumer League’s factory-safety expert, she worked closely with the two committees set up to develop new standards to prevent future workplace fires. In 1918, Al Smith, who had been vice chair of one committee, was elected governor of New York and named Perkins to a powerful state labor board. When FDR succeeded Smith in 1929, he named her industrial commissioner—head of the entire state labor department. When the stock market crashed and unemployment climbed beyond 20 percent, Perkins became the driving force behind the governor’s Committee on Stabilization, which called for public-works programs because “The public conscience is not comfortable when good men anxious to work are unable to find employment.” And when, thanks in good measure to his state’s bold response to the Depression, FDR was elected president, he invited Perkins to join his cabinet. Women who had lobbied for the appointment begged her to become the first female cabinet member, but she hesitated, mainly because her husband, economist Paul Wilson, suffered from mental illness. Finally, with Roosevelt’s promise in hand, she agreed. Her role in the famous first 100 days has been underappreciated. She was the administration’s strongest advocate for a federal relief program to help people who were, literally, on the brink of starvation. Roosevelt charged her with finding a plan, and she brought him what became the Federal Emergency Relief Act, the first federal welfare program. But her greatest achievement was persuading Roosevelt to support large-scale public works. He was skeptical, but Perkins and several progressive senators convinced him such a program was necessary to provide work for the jobless and stimulate the economy. Before the Hundred Days ended, Roosevelt pushed a $3.3-billion program through Congress—as part of the National Industrial Recovery Act—that would evolve into larger efforts, notably the Works Progress Administration. Perkins also chaired the Committee on Economic Security, which developed the Social Security Act that became law in 1935, and helped secure passage of the Fair Labor Standards Act, in 1938, which set the first federal minimum wage and banned products made by child labor from interstate commerce—her final major achievement. She faced more than a few setbacks as well: the war shifted attention from labor issues, and congressional conservatives, judging her too soft on Communists in the labor movement, tried to impeach her. But Roosevelt stood by her. She was one of only two cabinet members who served throughout his presidency. New York Times editorial board member Adam S. Cohen ’84, J.D. ’87, is the author of Nothing to Fear: FDR’s Inner Circle and the Hundred Days That Created Modern America, just published by Penguin.